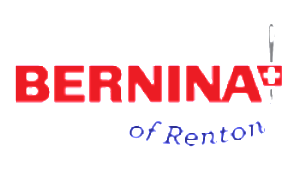 Every year our store donates a Bernina sewing machine to be given away in a drawing at the Sewing and Stitchery Expo in Puyallup. 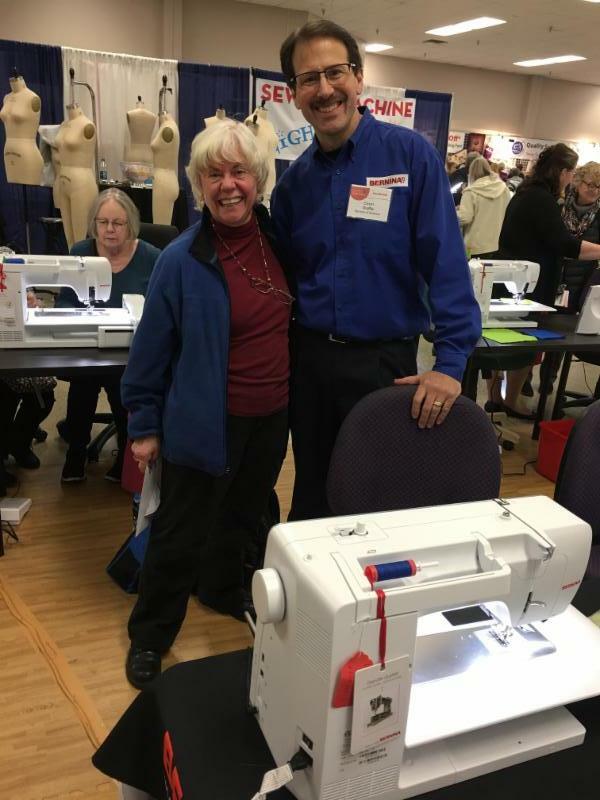 This year's winner of a new Bernina 535 is Vera Stritzel! Congratulations,Vera! Glad to see Cevin is showing you all of its wonderful features. It pays to fill out a ticket, so next year if you enter the Expo drawing, maybe YOU will be a winner! A SPECIAL THANK YOU FOR THOSE WHO STOPPED BY OUR SALES AND ACCESSORY BOOTHS AT SEW EXPO AND PURCHASED FROM US! WE APPRECIATE YOUR BUSINESS! You may have missed the free introductory class that was on March 24th, but that doesn't mean you can't still sign up and begin the class with the others on MONDAY, April 23rd from 10 until 12:30. The 2018 quilt "Sisterhood" will be taught by Debbie and the cost is $165. Monthly classes go through September and the border is an optional class in October. The best part is that YOU DO NOT NEED TO BRING YOUR SEWING MACHINE TO THESE CLASSES! Debbie brings her extensive knowledge of sewing HoopSisters Quilts and her classes will be lecture type with full instructions. Blocks will be downloaded onto your formatted thumb drive so you can complete your blocks at your leisure at home. The stitching on this quilt is detailed and is a feast for the eyes. Your biggest challenge MAY be deciding on which TWO colors you want to use! Call the store at 425-255-8673 or Click here to sign up and Debbie will get you all the information you need to begin this class on April 23rd. 1. Thou shalt not store a quilt in a plastic container or bag. This method often causes mold and mildew because it traps in any moisture, causing fibers to break down and leaving discoloration and staining. Another issue would be that plastic attracts insects. 2. Thou shalt not store your quilts with mothballs. The mothballs not only leave an odor that will not leave, but there is an ingredient in mothballs that will also break down fibers. 3. Thou shalt not store quilts in direct sunlight. Your fabrics will fade when placed in direct sunlight for long periods of time. 4. Thou shalt not store quilts in cedar or hope chests. Raw wood produces acid that is bad for textiles. 5. Thou shalt not store your quilt in a basement or attic. 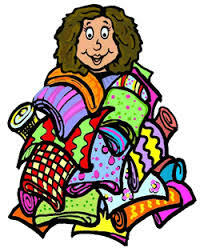 You will want to store your quilts in living areas of your home where the humidity and temperature is most constant. 6. Thou shalt not store too many folded quilts on top of one another. This will cause creases that will be difficult if not impossible to get out. 7. Thou shalt not keep the same quilts hanging for long periods of time. You need to change them out every 3 to 6 months to give them a rest from hanging and from any UV rays they are exposed to. Please take note that when hanging on wooden quilt racks you need a barrier between the quilt and the wood. Prolonged exposure will create brown spots where your quilt and wood were in contact. 8. Thou shalt not store quilts with newspaper or in cardboard boxes. They are full of harmful decaying agents. Have you seen what dishes packed in newspaper look like? 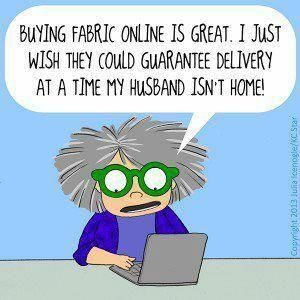 Consider what it would do to your quilts. 9. Thou shalt not use colored tissue paper when folding your quilts to prevent creasing. Colored tissue paper contains dyes that can easily transfer to your quilt. WHAT SHOULD YOU DO? How about storing them on an unused bed? Spread the quilts on the bed, separated by layers of cotton fabric or a cotton sheet to prevent dye transfer. Do you enjoy camping? Camp trailers? The 1950's? 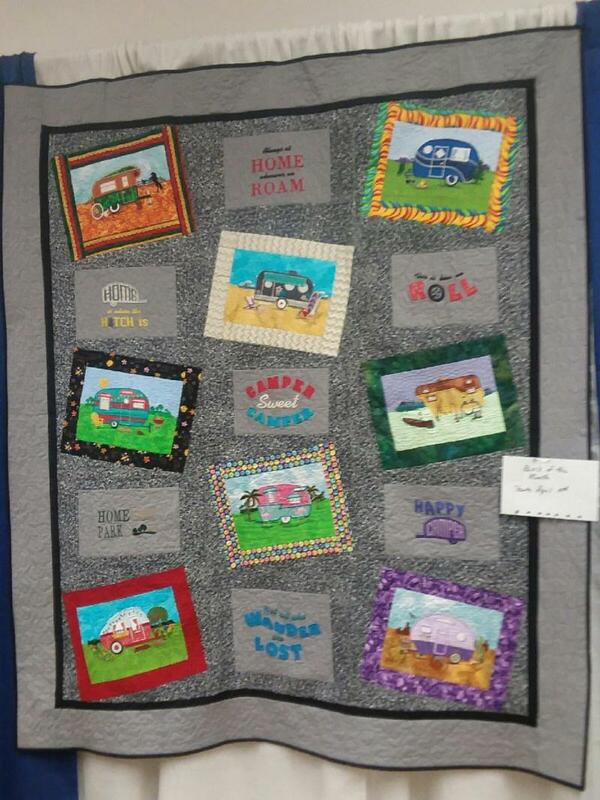 Here is your chance to make this camper quilt, which is appliqued in the hoop.The quilt finishes to a size of 66" x 69" and you can have fun selecting specialty fabrics or just dig around in your scrap box to create your special campers. The pattern has a CD with all the designs. 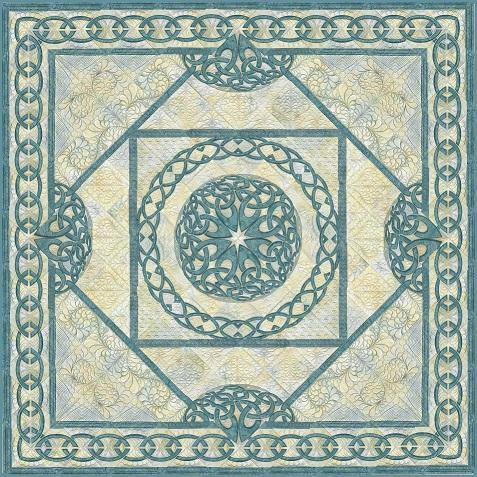 Let Patty lead the way for you as she guides you month by month to a finished quilt. The cost for this class is $45 and you can stop by the store to purchase your pattern. The first class will be SATURDAY, April 14th from 10 to 1 pm. Call the store at 425-255-8673 or Click here to sign up. Monday, April 23rd 10 to 1 pm - Lecture format, leave machine at home! 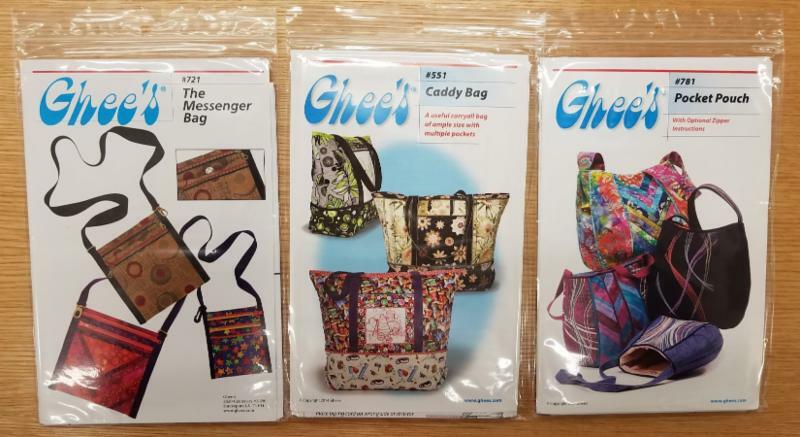 WE NOW HAVE A GOOD SELECTION OF GHEE'S PATTERNS AND SOME FANCY ZIPPERS! Stop by and see.